When people ask, what is your favorite type of bike to build, it is a hard question to answer, but I think I could easily point at this bike as a prime example of what I love about building custom steel and Titanium frames. Reilly rides a lot of road, but was inspired by Shige’s Monstercross bike, as a lot of my customers have been since. These bikes are so exciting because they can really open a lot of possibilities for riders, letting them go places they would not have ventured before. A chance to get away from cars or go out in the woods - that is a great thing to be able to provide someone. With these Monstercross or all road bikes i like to start with a familiar fit and feel. We add a bit of stability to the handling geometry and a high volume tire. Next the tubing is hand selected just for the rider. In this case a combination of Colombus Life, NOS True Temper and some Vari-Wall too will provide a snappy and responsive ride with a bit of comfort for those rough surfaces. Reilly picked out a top notch build with full bearings from Chris King, HED Belgium rims (one of my favorite alloy rims), White industries cranks and Sram Force drivetrain and brakes. We also topped it off with a Sklar Titanium Seatpost and some controls from SimWorks. I have to admit I am a little jealous. Reilly has good taste. Anyway, this bike is headed to Sunny Los Angeles, so I had fun shooting photos in the snow knowing this might be the last time it ever gets to see some. Dan lives in Brooklyn, NY and he spends a lot of time on his bike. In fact, Dan works on his bike day in day out as a bike messenger in the city. Sounds like a dream job, am I right? Anyway, While he get's to ride every day, his work bikes take abuse and he wanted something nice that he could use on the weekends to go exploring with friends and do some more intentional riding. Something he could ride through the city and end up out in the sticks on dirt roads and trails. We settled on a snappy light frame with some nice Colombus tubing. The bike is designed around 650 wheels. We built it up with the 48c Compass Switchback hills but it will clear a 2.3” knobby with ease. Dan picked out some choice American made components from the likes of Paul Components, White Industries, and ENVE. Top notch stuff. This bike is pretty Sklar through and through. It has nice durable parts that will last a lifetime and work flawlessly while doing it. The material choice is thoughtful and intentional, a balance of weight and durability and performance. It’s no race bike though. Hop on this thing, hit the road with friends and get out there. 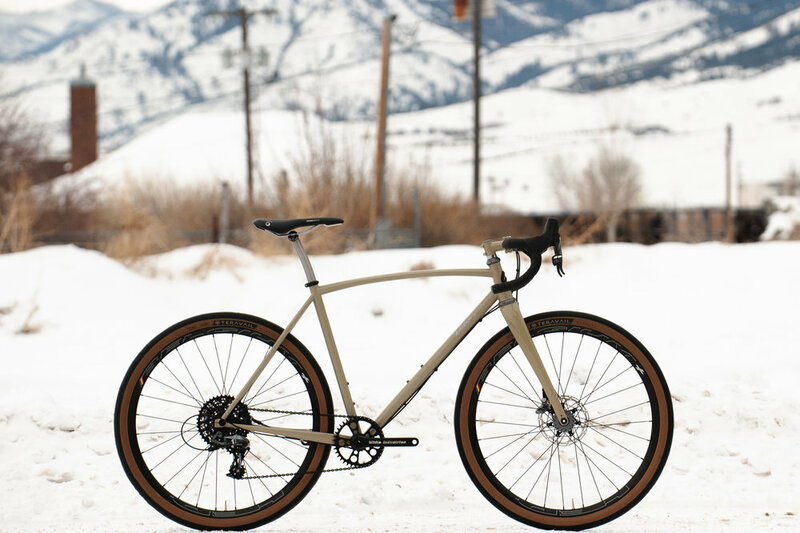 Learn more about Sklar Performance Hybrids and Flat Bar Gravel Bikes here. This bike was built for my Japanese distributor, SimWorks. The Monstercross category has been a big one for Sklar in the past few years. Perhaps it is my penchant for riding bikes on dirt and my disdain for getting in a car that attracted me to this style of bike and ultimately to designing and building so many of them. 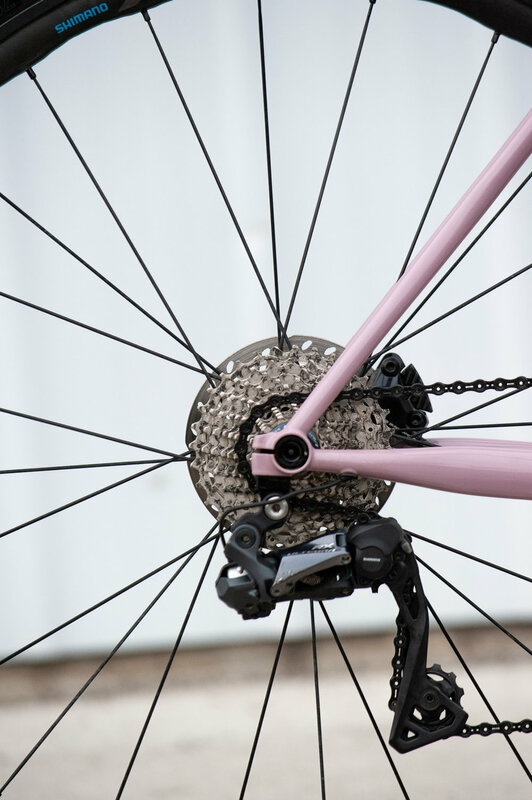 There is a really fun balance to strike between the pavement and single track ends of the spectrum when designing a gravel bike and tuning finding the perfect spot on that spectrum for each rider is a treat to be able to do. In the case of Joe’s Titanium monstercross here, Joe had spent a lot of time riding track bikes in the city and this bike would help him to venture more off road, so we went with something a little more on the snappy and responsive side, which makes a really consistently handling bike and something that is equally fun on and off the dirt. Titanium is a great material for this type of build. While the reduced weight is a nice perk, the subtle damping of titanium makes for a supremely comfortable ride and a very nicely tracking bike. We went with 27.5 x 2.1” tires for this build, which look very proportional on this build. Simworks topped of the build with goodies from Enve, Paul Components, a Sklar Titanium seatpost and Chris King bearings. All in all this bike is one that Joe can hop on and see where the day takes him, and that is what it is really all about. Learn more about Sklar Monstercross and all road bikes here. I have the privilege of building one-off, purpose build, custom bikes every day. As the industry has struggled to define the “gravel category” I have just been over here building bikes that make sense for their riders. 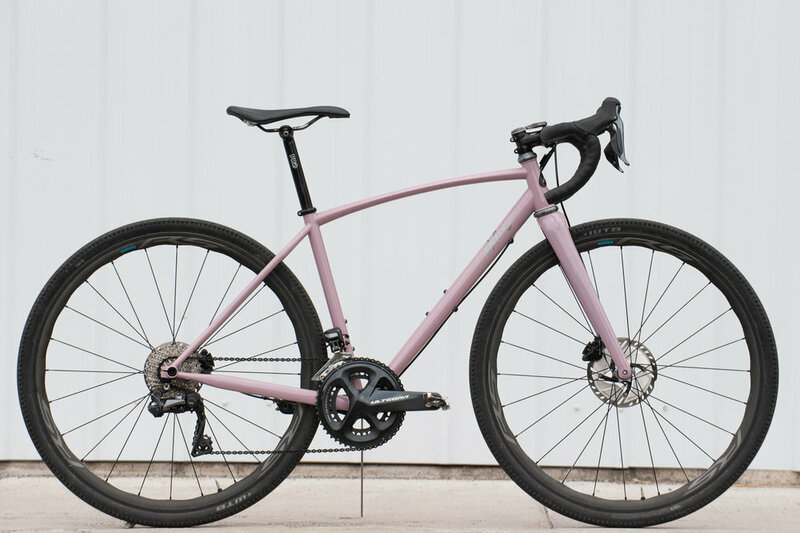 In an attempt to show my discontent with the need to slap a label on every last thing, I have called these flat bar gravel bikes Hybrids, because that is silly and labels don’t matter. Ben is one of the pals who got me in to riding bicycles back in the day. Growing up in Boulder, he got to spend a lot of time training and racing to be a super fast cross country racer. Needless to say, Ben can ride a bike really, really well. Anyhow, when Ben’s gravel bike was stolen last fall he knew he wanted to replace it with something better suited for his riding style. 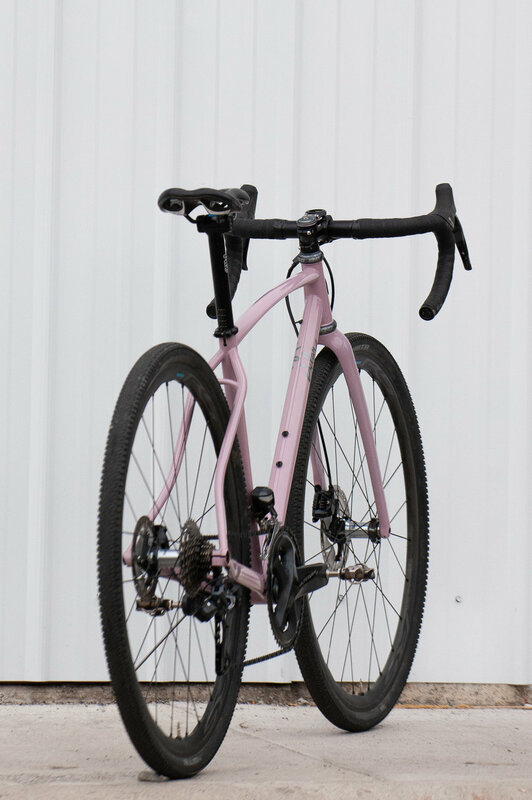 We decided on this all arounder gravel bike with a flat bar (which he can swap out for drops and a shorter stem if he ever likes) and simple 1x11 gearing. While its’ geometry and handlebar may be reminiscent of a mountain bike, the frame is constructed from beautifully butted tubing for a light and snappy ride that only steel can have. The build is classic workhorse parts with an emphasis on American made goods from White Industries. He also went with a Sklar titanium seatpost and some polished bits from Paul Component. I am happy to have been on this sweet ride and excited to have it take him anywhere he cares to go! Bill is a tall guy, and I like that with the suspension-corrected ENVE MTB fork, the frame looks proportional. But the size of this bike is one of its’ least notable aspects. Bill was looking for a new everyday bike, something that he could take out a few times a week on tarmac and get lost onto some trails and rougher roads on the weekends. Though pictured with the ENVE M525 wheels and 2.0” Maxxis tires, Bill will run the bike half the time with the ENVE G30’s and a 40c slick. Two setups to really tackle it all. On top of the custom geometry and large tire accommodation, this bike splits in two for travel. An S&S Coupler splits the down tube. Undo the two seat tube binders, pull out the seat post and the frame is ready to fold up and put into a standard sized box to take advantage of that free checked bag when Bill is flying around the globe for work. This build is all out. Chris King bearings all around with cranks from White Industries as well as Enve’s new gravel bar, post and fork and stem. Sram Force makes the gears shift. This bike should be great for Bill at home or on the road! My friend Mal hit me up this winter looking for a frame that she could do a lot of different kinds of riding on. Something that she could race cross on in the Fall but also put in big gravel miles the rest of the year, working her way up to the Dirty Kanza 200 next year. Cool! Luckily this fits in with a lot of the style bikes I not only build, but ride myself. Albeit I don’t think I will be seeing 200 miles of gravel in a day any time soon. Anyhow, we put together this nice build with some of my favorite components. Some nice light tubing from Columbus is going to keep this ride buttery smooth but real responsive for when it hits the cross course or some of those Seattle ups and downs. The geometry is pretty middle of the road between all-day comfort and aggressive race. We set up the handlebars so that they can get lowered for cross season with room to go up for those really big days if Mal finds herself needing that. Kitted up with 35c tires now, there is good clearance for a 45 or a lot of mud. A nice sweet spot for gravel bike tires. The build uses a full Shimano Di2 Kit which is super clean and crisp. Mal is working with Shimano on a “multi-surface” bike project over the next couple of years. All in all this is a sweet bike that can do a lot of different things! I know the one I ride like it has become my go-to this summer and I hope this does the same for Mal!